In a world overflowing with images, how can you tell who you really are? Marlene Moore wasn’t even sure why she accepted the job, except that it gave her the chance to just get in her car and drive. To escape, to keep moving, to maybe find a destination for herself. Now she is journeying around England, a land that turns stranger and more dreamlike the further she travels. Slowly, day by day, Marlene is falling prey to a sickness, a disease that seems to change the world around her. And the job itself turns out to be far weirder, and more dangerous, than she ever imagined. 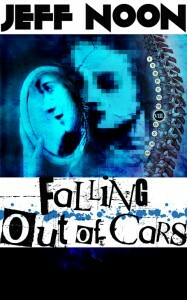 A road novel like no other, FALLING OUT OF CARS explores a country, and a psyche, falling off the edge of reality.